Last month, legendary investor Warren Buffett took direct aim at fees investors pay. While most everyone agrees that an investment fund manager is entitled to make a profit, Buffett thinks that investors are paying too much in fees. We agree and also take issue with the prevalence of so many hidden investment fees. Investors can’t fight back if they don’t know about hidden fees or if the fund is charging incorrect fees. These fees, however, are ripe for SEC Whistleblower actions. The whistleblower lawyers at MahanyLaw are investigating claims that investment funds are overcharging or concealing fees from investors. If you have inside information about one of these violations, please contact us immediately. You may be entitled to a large cash award through the SEC whistleblower program. Keep reading for more details. Many funds and investment products hide their fees. They don’t want to be transparent. If investors knew about these hidden fees, they might invest elsewhere. A recent survey by Rebalance IRS found that 46% of baby boomers incorrectly believed that they paid no fees on their retirement accounts. Another 19% erroneously believed they paid .05% or less in fees. These fees quickly add up. 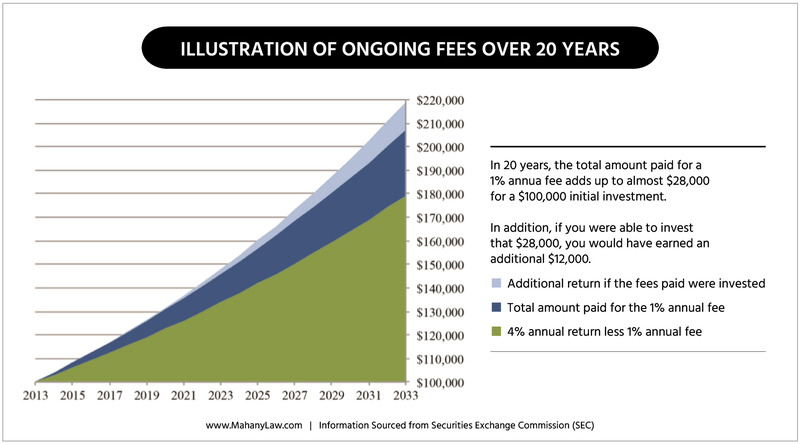 The graph below shows what just 1% in fees can do to your investment over time. As the fees increase, the losses increase even more dramatically. The average investor knows about sales commissions but there are many other fees that may be charged. Some investments levy a charge based on the value of the account or investment. Others charge a fee based upon the performance of the investment. And then there are all the account fees (wire transfer fees, transaction fees, account inactivity fees, etc. Why are investors so misinformed? Because fund and investment managers do a great job concealing fees. There is often little transparency. The SEC (and sometimes the CFTC) has the statutory authority to regulate and monitor fees in the investment world. Obviously not every investment will make money but regulators want to insure there are full disclosures on fees and commissions and that customers aren’t being charged too much. When a company or individual violates federal securities laws or SEC regulations, the Commission can take enforcement action against the wrongdoer. Relief can include monetary penalties as well as restitution orders and injunctive relief. The latter involves ordering a company to stop violating the law, banning individuals from the securities industry or ordering a company to improve its compliance. Whistleblowers who report violations of SEC laws and rules are eligible for awards. The awards are based on the amounts collected from the wrongdoers. SEC whistleblower awards are often in the millions of dollars. The Commission can award between 10% and 30% of the amount of any fine or penalty it collects. To become a whistleblower, one must have inside knowledge of the wrongdoing. The SEC won’t award those responsible for the wrongdoing, however. In the last several years, the SEC has collected hundreds of millions of dollars from companies accused of either improperly calculated or hidden investment fees. Be a whistleblower in one of these cases and you can earn a huge award. To better understand when whistleblower awards may be available for hidden or illegal fees and markups, let’s look at some actual cases. The following several cases were picked at random. Don’t let that fool you into thinking that other companies aren’t doing similar things. As you will see below, one of these companies self reported its violations (those violations caused over $100 million in harm to investors). Despite self reporting and promising to clean up how it charges customers, that same company was in trouble two more times in the following months. On January 26th, Citigroup affiliate Citigroup Global Market agreed to pay $18.3 million to settle charges that the company overcharged investment advisory clients. The Commission found that over 60,000 investment clients were overcharged. The incorrect charge occurred because the company filed to honor rates promised to clients. In some cases, the company was charging fees to clients who had suspended their accounts. In other cases, the company could not even calculate how much the client should have been charged. Why? Because approximately 83,000 new account documents could not be found! The SEC’s order specifically found that even when savvy clients would negotiate lower fees, the company’s software would often restore and charge the higher default fees. The overbilling went on for 15 years before the company was caught. Citi has voluntarily reimbursed all customers and agreed with Commission staff to revamp its records retention protocols. The company also agreed to periodically test their billing software to insure customers are correctly charged. State Street Corp. self-reported in 2015 that it had overcharged customers for 18 years. They believed the overbilling cost customers over $200 million. The hidden and overbilled fees were often for things like postage and printing. Despite the self-reporting, the State of Massachusetts charged State Street a year later in 2016 with overcharging clients for “secure electronic messages.” According to the complaint, State Street was charging customers $5 for an email when the cost for that service was virtually nothing. Like many other hidden fee cases we have seen, the SEC found that the State Street “tucked its hidden markups into a corner where [customers] were unlikely to notice.” The company paid a total of $382.4 million including $167.4 million to the SEC, $155 million to the Justice Department and at least $60 million to customers. The SEC charged The Blackstone Group in October of 2015 with failure to disclose the benefits received by the firm through accelerated monitoring fees. The SEC collected $39 million, of which $29 million was returned to customers. According to public filings, Blackstone failed to disclose the acceleration of monitoring fees. Blackstone’s actions reduced the value of the investments prior to their sale but never informed investors. To disguise their greed, the brokers would misrepresent the price at which the customer had purchased or sold their securities. In periods of high market volatility, it is easy to hide these illegal markups. We are looking for brokers, sales agents, IT workers and compliance professionals that work inside investment banks, hedge funds, commodities brokers or other financial firms. If you have information about improperly calculated or illegal hidden investment fees, we hope to speak with you. In the last 5 years, our financial services whistleblowers have collected over $100 million in whistleblower awards. We have the experience to investigate and bring these claims. Many potential whistleblowers worry about retaliation or blacklisting. We are happy to report that the SEC and CFTC have excellent track records in protecting the identity of whistleblowers. In the unlikely event of retaliation, the SEC has very robust anti-retaliation rules. We will be there too, ready to file retaliation claims and defend your rights. or by phone (direct dial) at 414-704-6731. All inquiries protected by the attorney – client privilege and kept fully confidential.